I cannot thank Brandon enough for being the best wedding DJ! He met with me several times over the course of the year to ease my mind about any concerns I had ( which was a lot ). He gave me so many songs suggestions for different parts of the wedding. I didn't want to have to come up with a playlist, he managed everything on his own and crushed it!! Everyone at my wedding was dancing until the last second. We had so much fun and the music was on point! He is an even better MC and made all aspects of the wedding so much fun. He took all my stresses away and let me enjoy the wedding day. Thank you so much! Brandon is by far the best DJ I have ever experienced at a wedding. I was SO pleased with the decision I made to have him at my wedding. He is spunky, fun, and excellent at making your party run smoothly. His skill in making transitions clear and easy comes so naturally. He will honestly be the life of your party! Brandon was AMAZING!!! We literally didn't have to worry about ANYTHING the day of our wedding - after our ceremony, we weren't at all worried about what was happening in the reception area because we knew Brandon was there taking care of everyone. Our guests loved him and kept asking who was the guy with the microphone! The song selection was great and even though we were nowhere near the schedule we'd originally laid out, he was flexible and rolled with it and really made our celebration into the party we had dreamed of. Thanks for making our day so much fun, Brandon! Highly recommended. Brandon brought our wedding to life and we can't thank him enough! He was so fun and just overall awesome to work with. The minute we met with him the first time it was like talking to an old friend. Just by us talking and explaining our relationship he put together an amazing playlist that was definitely a crowd-pleaser. He read the audience and changed songs to flow with the lively atmosphere. He even emceed the evening and got a lot of laughs...our family and friends are STILL talking about how perfect he was for the event. Thanks for everything, Brandon! Brandon did such an amazing job MCing & DJing our wedding in May. He met with us as many times as I requested before the big day. He's extremely organized with detailed notes that he'll also send you a copy of to confirm everything is correct. We didn't have him there for rehearsal and EVERYTHING went off without a hitch the day of! I remember at one point during the night he asked if I was ready to toss my bouquet.. and I told him sure but I had NO idea where it even was. He simply responded with no worries I already have it ready to go! We genuinely loved working with Brandon. Brandon was so great to work with an did an absolutely phenomenal job DJing/Emceeing our wedding! We can't keep track of the number of guests who told us how smoothly our whole wedding went thanks to Brandon's ability to keep things moving and making it so much fun! In only a few short meetings, Brandon was able to understand our style and create exactly what we were looking for in our wedding day. He was super accommodating on the day, interacted amazingly with our other vendors and guests, and the dance floor was full the entire night thanks to his awesome song choices. Brandon is just the best and we can't recommend him enough! Thanks so much Brandon! My wedding planner told me how important it is to have a good DJ who can keep the wedding moving along smoothly, and Brandon was just that! He has an awesome personality, and he's just great on the mic. He kept the wedding lively and entertained. I hardly had to do any work in choosing out the music because he had a great feel for the crowd and played accordingly! Let me start off by saying, you need to book Brandon if you haven't already. He is hands down the best DJ. Extremely reasonably priced, incredibly friendly, and so great at what he does. Everyone told me after our wedding what an amazing job he did. One of my friends came up to me during the wedding and asked, "where did you get him and why did I not find him for my wedding." He kept people on the dance floor all night and we had the best time with him. He was so genuine and friendly, literally could not have asked for a better DJ. He met with us twice to go over everything and called me the week of the wedding just to run through everything. Thank you again Brandon! Brandon was the BEST DJ/Emcee we could have ever asked for! He was so easy to work with and very professional. He picked up on our style right away and knew exactly the music choices we wanted to hear for our special day. We HIGHLY recommend Brandon!! Brandon was everything we could have asked for and more. He DJ'd our friend's wedding, so we had high expectations for ours. Brandon met with us several times to go over event flow notes and custom playlists. He was willing to set up a few different areas to make sure our sound was covered for the ceremony as well as the reception. Brandon has a very good sense as an Emcee and DJ. He carried the night flawlessly, keeping us on schedule, and was funny without making himself the start of the show. We gave him a few do/do not plays, but left it pretty much up to him to feel the crowd and play different songs from different eras. We had folks from different generations up and dancing all night. 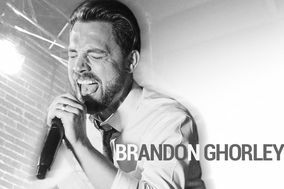 A good DJ/Emcee will make or break your wedding and we can honestly say that Brandon was the best investment we made for our wedding in terms of performance and value. Would absolutely recommend him for anyone's wedding. We hired Brandon as our Emcee/DJ for our wedding. He did an incredible job. Our wedding ran so smoothly because of him. He is an expert musician and Emcee. I highly recommend him. Our guests were raving about the music. It was a true pleasure working with Brandon. Hire him, you won’t regret it.